Many local businesses offer goods and services to people in a certain geographical region in lieu of or in addition to a brick-and-mortar location. There’s also mobile (ex. food trucks) and home-based businesses out there that may need to specify which regions they service. So how do you do put your service area information on Google you ask? Enter your service areas in Google My Business. 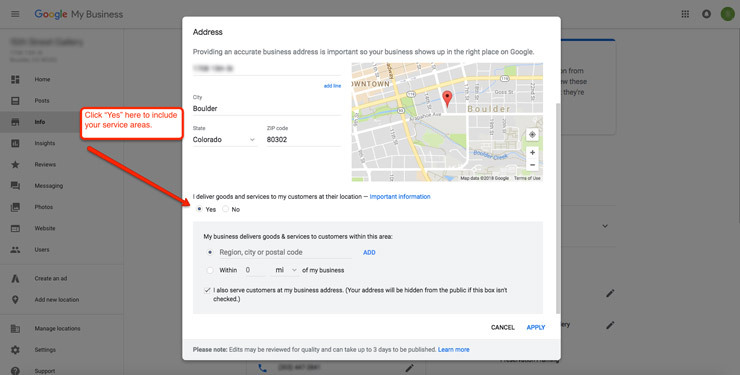 Login to Google My Business and visit the Info > Address section of your account. Then select Yes for “I deliver goods and services to my customers at their location”. Use Schema.org markup (structured data). Have your service areas listed in text somewhere on the page/website and list them in your Schema.org markup using the areaServed property. JSON-LD format is recommended. Note: Google recognizes Schema.org markup for service areas but the only guaranteed way to have them listed in Google’s search results is by completing this task in Google My Business. Bing and Yahoo! recognize Schema.org markup as well. This property can be used for the LocalBusiness, Organization, Service, Offer, ContactPoint, DeliveryChargeSpecification, and Demand properties within Schema. Use the LocalBusiness or Organization Property. This will cause all products and services to be available only to the service areas listed. You would use this option if everything you do as a business is confined to those service areas. This would include products and services. This will cause specific products and services to be available in the service areas listed. You would use this option to list individual services and their service areas. This would be best if you have different services for different areas or have services for specific areas, but also sell products outside of those areas. This example states that the service areas for this business are two specific cities. Note: You can list Cities, States and/or Countries. See AdministrativeArea for more details. The following two examples utilize the GeoCircle property to establish Service Areas by a certain distance from either the business location or another specified location. This example states the Service Area of this business is 100 miles from their address. This example states the Service Area of this business is 100 miles from these coordinates. Note: geoRadius uses Metres by default. However, you can specify another measurement if desired. Now you can easily list your Service Areas with search engines (in particular Google). Please let me know if this has helped or if you have any thoughts regarding the Schema implementation aspect below. Perfect! This schema is just what I was looking for. Are things that seemingly apply to every page of my site. Is it recommended to include this type of schema on every page or only the Home Page? Hi WK – Most of the time, you’ll only want it on the home page. Unless you have more than one location and need to put it on each location page. Does it suffice to just add the service areas to GMB? I think you touched on that in the article, but I’m asking for some clarification. I’ve got service areas listed in GMB, but I don’t know if it would it be too redundant adding it to the schema markup as well. Adding service areas to GMB is the most important for Google, however, adding Schema on top of that would expand your service area information to Bing and Yahoo as well.